Developer Quote: "This Science preschool educational app from the developers of PBS KIDS PLAY! lets kids 3 to 7 years old learn a lot about seasons, weather, even months and days of the week while playing the game and having fun!" Preparing your child for school is one of the most important jobs of parents. There are many aspects to this...social interaction as well as the 3 R's (that being reading, writing, and 'rithmetic!) However, most folks forget about an equally important subject - Science! Science plays a huge role in school studies and testing throughout school years. Seasons and weather are beginning Science topics taught to young children in the classroom often using velcro cut-outs for figures and seasonal items. Why not start your child off right now learning these same things comfortably in their own home using i Learn With Poko: Seasons and Weather! HD on iPad? 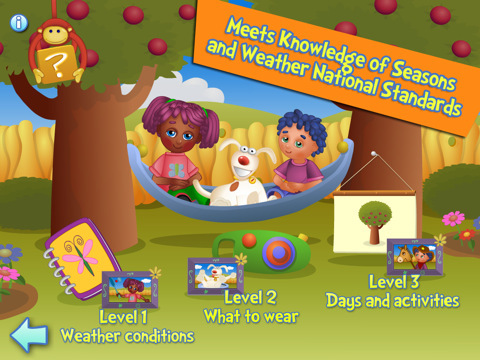 This educational yet entertaining app for children aged 3 to 7 years old teaches about seasons and the type of weather to expect in each, how to dress accordingly, and what activities can be enjoyed seasonally. (Incidentally, this app is brought to you by the developers of the excellent PBS KIDS PLAY! and CBC Wonderworld online learning programs). 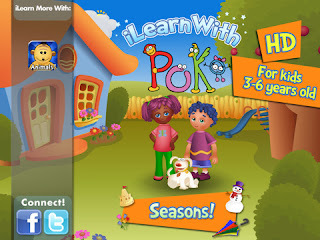 i Learn With Poko: Seasons and Weather! HD is a colorful, cheery, and encouraging way to learn while steadfastly holding your child's attention. - High quality game designed for the iPad's large screen. - Teaches like an educational book, plays like an engaging game. 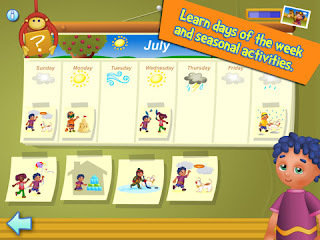 - Teaches facts children should know about seasons and weather, along with clothes and activities adapted for each. - Designed with child developmental psychologists and educators. Meets National Standards for Science teaching in Pre-K and Kindergarten. - 3 levels of difficulty, increasing in complexity, and adapted to your child's progress per level. - Preschooler friendly with audio clues and instructions. Reading skills are not necessary. When you open the app, you will see 3 levels included which cover different topics. In Level 1 - Weather Conditions are discussed. In Level 2 - What to Wear for each situation is covered, and in Level 3 - Days of the week and suitable Activities are taught. Poko and Beebee are the little boy and girl who will lead your child easily through the functions of the app, along with some adorable pets and child-rendered scenery in muted colors. The familiar, child-like images instantly put your little one at ease, and are easy on the eyes. Let's take a look at how learning becomes a game in i Learn With Poko: Seasons and Weather! HD . First of all, help Beebee locate for her photo album the pictures that denote specific weather conditions in Level 1. You will be asked to identify rain, clouds, snow and other such conditions. After that, in Level 2, try to assist Beebee and Poko to find the clothing and objects that do not match the weather of a particular day. In the final learning segment, Level 3, figure out all the things Poko has done recently based on the month and weather during that day. Your child must match the pictures together to complete each day. These are just a few of the age-appropriate and fun activities of this app. The animation, sound effects and adorable characters in Seasons and Weather will engage children and keep them happily occupied learning for hours. When activities are answered correctly, your child will receive words of praise. Thus, their self-confidence will grow as will their familiarity with seasons, weather, days of the week and months. COOL CONCLUSION: "Capture the attention of your young ones while teaching the basics of Science using i Learn With Poko: Seasons and Weather! HD ." --Special Note: Visit the iLearnWith for more info, updates, videos, and announcements. Disclaimer: You have enjoyed an impartial, paid post.